Successful team building delivers successful results. We love the challenge. We love the breakthroughs. We love this work. Whatever issue might be keeping the full potential of your team from emerging, whatever unique situation you need addressed, energized, or resolved, let us know. We don’t profess to fix everything; we do deliver indispensable tools and unforgettable experiences in a spectrum of amazing ways. We have a spectacular team of colleagues and a deep network; if we cannot help you, we probably know who can. Check out a few of our recent clients had to say. To us, there is nothing like facilitating transformation and we’re honored we can help our clients shine. “Prior to working with Source Consulting, our team was struggling. I am an experienced leader with plenty of expertise managing conflict, but we had too many strong personalities fueling interpersonal problems in the workplace, and it was impacting our effectiveness. Solomon worked with individual staff members, with all of us as a team, and with our Supervisors to help everyone recognize and address the underlying issues and reactions that were causing so much trouble. Our experience with Source Consulting was a much-needed breath of fresh air, and I can honestly say we are a stronger, more productive team because of it! “On behalf of our Director, Merry Jo Hopkins, and the staff at the #1 WIC Agency in Texas, LA-77, we want to THANK YOU for such a passionate message and a breath-taking interactive rhythm program!!! We are all very touched and continue to talk about how important an active, positive team member is, not just at WIC for our clients, but in our personal lives so that we can continue to excel as representatives of this wonderful mission of service to others. Your powerful messages were on point for our new computer system transition and will no doubt be shared and carried throughout our State Audit and beyond. As you saw our request, our staff were so moved by your interactive rhythm program, they have requested a set of drums for their clinic. Many of the staff still continue to report to our Director how phenomenal this day of the training was. Some of the staff’s comments include: “The music brought out the energy and soul in me”, “His speech and sessions are definitely memorable!”, “He is at the very top of the ‘BEST SPEAKER’ list LA-77 has had”, “Oh I love him! He was so humble and had me so engaged throughout the sessions, I didn’t want to go on break” “We really enjoyed how interactive he was. We loved getting to move and participate in teams.” One of the quotes they really liked was “Don’t just say you are, do what you say you are”. Your messages have reached our souls and will carry us forward with the additional touch of energy and confidence that we desired for the LA-77 Team. Organizational culture change can be tough. How do you meet the challenge of inspiring 60+ people to truly buy into a new direction (especially right after a reorg), engage a high performance team development process, and keep it sustained long after the training? Working with their key internal training team, we assisted the enunciation of key concepts for high performance, and helped design a simulation based process for engaging every team member. Not just team building, this was a process of getting the team beyond understanding and into the behaviors needed to change the organization and sustain the change. We customized an approach that was unique to the clients values and mission and spoke directly to their areas of need and redirection. [Source Consulting Group] works hard to understand client needs, customize training, and delivers results as an authentic partner. [They have] a wealth of expertise in the areas of experiential learning, leadership development, and group dynamics. [We] partnered with [them] to design and deliver a series of 3-day teamwork training sessions and the results were outstanding. Many participants said it was the best learning experience of their professional lives. Sometimes, even the highest functioning team needs a tune up. And, even finely tuned teams need to invest time to reinvent themselves as they grow and excel. The over-focus on task accomplishment leads to a breakdown in the mission critical areas of trust, communication and synergy. How do you get a well oiled team to be fully on board with the need for revitalizing the core relationships? It began with reestablishing high trust and effective communication in the leadership team. Our process systematically brought the leaders to a clear understanding of their impact, and a remembering of the passion they had for their team. Through successful guidance of crucial conversations and interactive processes, resolution occurred, skills were built and re-built. Individuals rose to new levels of accountability as leaders – behaviors changed. I just wanted to send you a heartfelt thank you on behalf of the City of Austin’s Office of Real Estate Services! Our organization has been going through a number of changes and facing tough new challenges this past year. And of course, we have to keep all of the plates spinning without missing a beat. Although we can tackle any real estate-related issue thrown at us, we are not experts in interpersonal relations. But like many a real estate transaction, we’re well aware of the value that an expert consultant can bring to the table. [Y]ou were able to develop a solid game plan that not only addressed the discord that was beginning to surface in our team, but head off issues that were right around the corner. Suffice it to say, after experiencing what Source Consulting brought to the table, you’ve turned every skeptic into a believer! Kudos to a job well done Source Consulting Group!!! Global business – it’s the world we’re in and it offers unique challenges including building a team when its members are geographically dispersed. When a group of engineers from FLUOR Corporation met to build the relationships, and align the team for a new project (a brand new team), time was short, business agenda’s were detailed and real connections needed to happen. With only three hours of agenda time with which to work, we got right to it. By utilizing dynamic simulations and a celebratory capstone to the process, we succeeded in taking a group that barely knew each other, to the solid first stages of a high performance team. Wow! It all began with […] the concept of an upbeat, high-energy start to my team building. A concept, I must admit, I was skeptical of at first. I mean who takes a bunch of linear-thinking engineers and gets them drumming (and liking it). The concept began to come to life, but I’ll admit, I was still uncertain. Then it really came to life. I repeat, WOW! You helped launch what turned out to be a very successful learning/working/growing experience. Thank you so much. Schools have a tough job these days. Under public scrutiny, and constant budget cuts, they have to educate and nurture the youth of our world – with excellence! And sometimes, the food service team gets left behind – we forget that healthy, well nourished kids learn best. The Lodi school district needed us to re-energize their 300 member food service team – to get them engaged for the challenges ahead – and they’d never had a full team development process before. We designed a powerful day’s blend of simulations, team challenges and large group process. We specifically focused on tapping into each individual’s passion, while creating a context for enhanced interpersonal connections. The day completed with viscerally reinforcing the power of what they achieve as a unified front. [The Source Consulting Group] team provided our organization with a literally life-changing professional experience for many on our team. [Their] ability to lift morale and shift counter-productive attitudes is incredible. In addition, […they…] are incredibly personable and helpful every step of the way, including the planning process. 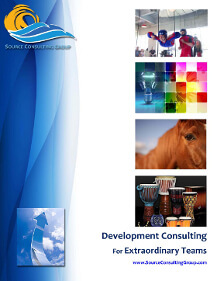 I can say from experience, that [the Source Consulting Group Team] provides a necessary commodity to any organization. The Organizational Development team at this top hospital had a vision. They wanted to get all 1500 (very busy) members of their hospital staff aligned, re-inspired and focused on the values of Integrity, Compassion, Accountability, Respect and Excellence. We had to deliver a relevant, sustainable learning process – with only 60 minutes per session. We utilized our unique ZaBoomBa process to ignite engagement with the message, while delivering a learning context where understanding transformed into behavior change. I’ve been trying to write you a THANK YOU, but words seem so inadequate to express how FABULOUS the session was […]. I guess I should do a drum solo or something!! We ALL thoroughly enjoyed the session. You did an excellent job of meeting our objectives and tying in our vision, values, experiences, etc. It was way more than FABULOUS!! Thank you so very, very much!! Taking cutting edge business concepts and making them relevant to the deep heart of a multi-national organization requires exceptional skill. Even more so when these concepts must align with the organization’s core values and mission and the people have to feel that connection not just hear it. Using various modalities from the Inner Wealth process, we added to the powerful learning context our client created in their retreat. Transformation happened as participants moved form awareness to experience. [The Source Consulting Group team] are among the most talented people we have come across in our international search for faculty for the Two Worlds Wisdom School and the Kaiser Institute. They have led sessions, facilitated group experiences, and contributed to our events in many other ways. Working with them is a joy—watching people be swept away by their charisma and grace is a joy. They are extraordinary people! 500 middle and high school students were brought together to have dialogue, and to deepen understanding about race, culture, class, and gender. Tough conversations to have no matter your age. The task was to keep the youth focused and engaged, to ensure real learning and understanding occurred, and end the day with students inspired to create social change in their schools and community. We tapped our Youth First programming to develop the curriculum for the day, and designed the training for the youth leaders who facilitated small group discussions. We led large group experiences and created activities to keep energy levels high while focusing on the topic at hand. The event’s success led to 10 consecutive years of the program. [The Source Consulting Group team] worked with our YWCA Youth Forum on Race for an astounding 10 years! Every year they bring the energy, passion and expertise to motivate 500 young people to break down stereotypes and come together for a united spirit in which they feel empowered to tackle issues in their communities. Kenya Masala is a one of a kind phenomenal leader who has the ability to help people and organizations realize goals for their programs and organizations; often far beyond what they had originally imagined. I recommend Source Consulting Group wholeheartedly for any program or event involving youth – they are exceptionally skilled in youth work and the results are success, success, success! Bringing 70 young people together for a week long Peace Summit can be a challenge in and of itself. Bringing 70 young people together, from close to 30 different countries is a true and wonderful challenge. And, after 4 successful years of meeting this challenge, it was time to make the Global Youth Peace Summit even more impactful. Not only did we direct the Summit during 8 incredible days, we set to work ahead of time to build the infrastructure our client needed for success. We designed and delivered staff development and training processes for youth and adults, hired and managed staff, organized the daily agenda, facilitated stakeholder meetings and oversaw the smooth flow of the GYPS from start to finish. The impact Source Consulting Group has had on the Global Youth Peace Summit is immeasurable. With their support and guidance, the Global Youth Peace Summit has grown from a grass-roots project hosting 30 youth and 30 volunteers to an internationally-recognized program uniting 70 youth from 25+ different countries and 100+ volunteers. From the expertise they lend when it comes to team building activities andyouth leadership development to the incredible time, energy, love and devotion they put into making the Global Youth Peace Summit the transformational experience it is, Source Consulting Group can always be counted on to deliver excellent, heart-centered youth programming that makes a huge impact on youth and adults alike. Dell | CHRISTUS Health | The Universities of Arizona, Texas, California (San Diego) and Western Washington | The States of Arkansas, Arizona, Maine, and Wyoming | Rutgers University | The Nature Conservancy | Organic Valley | The National Childhood Obesity Conference | The First Things First State Program | The Federal Office of Adolescent Health | Chevron | Seton Hospital | Qwest | Premera Blue Cross | Fujitsu | REI | Shape Magazine | Canyon Ranch | The Diocese of Dallas and Little Rock | Gear Up | Cottonwood De Tucson Treatment Center | Multiple districts and schools across the Unites States. We’re ready to put our experience and success to work for you.